Home / Welcome to The Military Wallet! About The Military Wallet: The Military Wallet is a personal finance and benefits website for military members, veterans and their families. Our goal is to help the military community better manage money and understand the variety of programs and benefits available to them. About The Military Wallet Podcast: Our podcast is featured on iTunes, Stitcher, and other locations. Our podcasts typcially feature in-depth discussions on military and veterans benefits, including those on retirement, health care, education benefits, Guard and Reserve topics, and more. Each podcast is accompanied on our site with a full length article – giving you a resource you can come to in print and audio. You can learn more here: The Military Wallet Podcast. 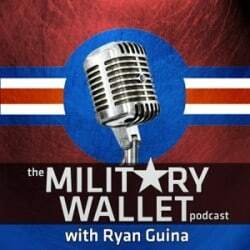 The Military Wallet Podcast on iTunes. The Military Wallet Podcast on Stitcher. In the news: The Military Wallet has been featured in Military.com, Stars & Stripes, USAA, Bankrate.com, CNN Money, Forbes, US News & World Report, Fox Business & Fox News, Time Magazine, Yahoo! Finance, and a variety of other websites. About the founder: My name is Ryan Guina and I served 6.5 years in the USAF as an aircraft mechanic. In 2014 I joined the Air National Guard after an 8.5 year break in service. I currently serve in the Air National Guard (please note I do not speak for the military – thoughts are my own and those of the individual writers on this website). My goal is to share as much information with our nation’s veterans and family members as I can. I hope you will find a lot of useful information within these pages and in our podcast! I also run the personal finance website, Cash Money Life, which covers personal finance and money management topics. Comments: Comments are necessary and welcome! Feel free to share your stories, ask questions, or leave comments about where others can find useful information. Please refrain from leaving personal attacks, or SPAM. The web owner reserves the right to moderate or delete comments. Contact Us! Please feel free to reach out to me if I can help you with any military benefits topics. We also accept limited advertising arrangements, so long as they are a good fit for the greater military audience. Please contact me for more information. Thank you for visiting, and I look forward to sharing information and helping you get the benefits you deserve!